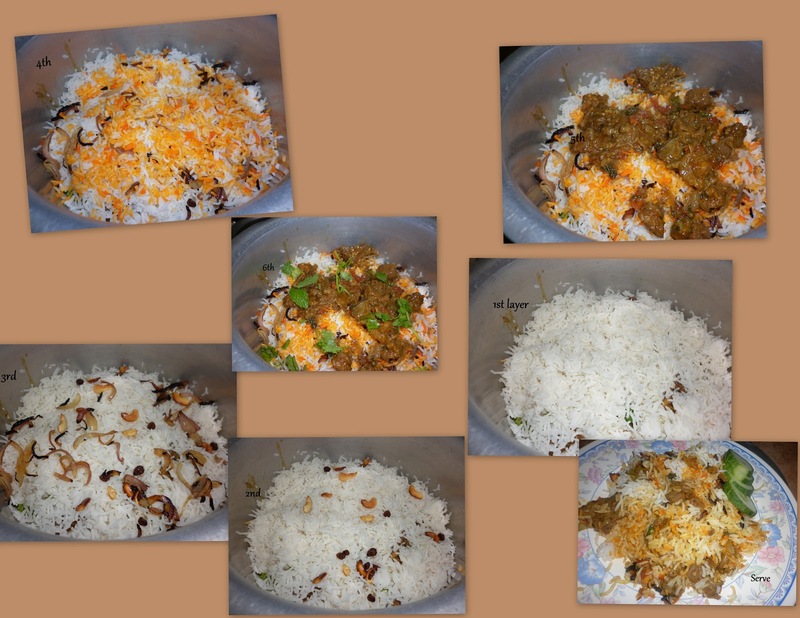 Briyani are usually made in spl occasion,we use to make monthly once on any Sundays ,this briyani i made on my daughter's birthday it came out well.It was awesome to eat it hot on these rainy days. I made gravy and rice separately and mixed it . 1.Boil water,add washed rice into it,add salt,when 3\4th cooked drain water and keep aside. 2.In it take a small amount and add colour powder to it,mix. 1.Clean mutton well, mix with 2 tsp of ginger garlic paste and cook in cooker for 2 whistle. 2..Heat ghee(3tsp)& oil(3 tsp) in a heavy bottom kadai,add onion,green chilli,ginger garlic paste and saute,add tomato and all powders.salt & cooked mutton and mix well. 3.Cook for about 10- 15 min till all masala mixes well with mutton,add spices according to ur spice level.Your gravy is ready. 4.Cut 2 onions horizontally and fry&keep it,fry cashews and raisins in ghee & keep ready. Now we have to assemble. Take a thick bottom vessel. Add ghee,little cashew & raisins,then a layer of rice,followed by fried onions,mint leaves & cilantro,coloured rice,then layer of mutton curry and repeat in the same manner till rice & gravy is over. Keep the vessel in very slow flame with lid for some times. i.e. keep in dum for some time.